As of this writing, we have 1038 members, more or less where we have been for some time. One interesting aspect of our union, which accepts everyone who applies, that we hundreds of new members join every year, and when things don’t work out for whatever reason, hundreds leave as well. There is tremendous churning at the level 1 recurring, with a much more stable and renewing membership among more stable working writers, especially those with 2-year press cards. In the first half of 2018, 297 new members joined the union, a reflection of us having achieved a slightly higher visibility and also reflecting the potential that exists for growth. We have also had 685 people renew their membership, a solid vote of confidence by about 70% of the members. We will discuss at the DA how we can do better at retaining new members ad how the national office can do more to assist the chapters in this process. One of the significant developments for NWU has been the emergence of group Non-Payment Grievances as a way of organizing blocks of freelancers. This current process began back in 2009, when we organized 36 freelance writers, translators, editors and graphic artists who were owed more than $350,000 by Inkwell Publishing in NY. It was a very complicated and expensive struggle as it involved the misclassification of employees and wage theft. With the assistance of the UAW legal department, we ultimately prevailed in federal court, winning a $365,000 judgment, but never seeing any money as the company went broke and dissolved. A few years later we took on two more cases, but these were clearer cut. At Natural Solutions (NS) and Heart & Soul (H&S), we represented freelancers who were contracted, published and were unpaid. Again, after organizing the writers to join the union and act as a group, and with the UAW legal department contracting labor lawyers in Minnesota and Washington DC, we were ultimately able to get the dozen writers at NS paid the $12,000 they were owed and about 18 H&S writers and editors more than $150,000 that they were owed. Currently we have three cases underway. Six writers are owed about $17,000 from Uptown, based here in NYC and that case is going to court with the assistance of the UAW legal department. At Consumer Digest, based in Chicago, we are representing 17 writers owed more than $63,000. We have a signed payment agreement there and the owner has missed his first two payments, not a good sign. At Latina and Latin Kitchen, owned by the Solera, a private equity fund in NY, we collected more than $43,000 for 14 freelancers. We are trying to get the last five writers the $7,000 they are owed. We are talking with freelancers at other publications about organizing group NPG’s, including one at a Spanish-language outlet. Just about all of the current and potential NPGs are a direct result of our campaign at Ebony this year, which seems to have moved things up a notch or two. As most of you know, the Ebony campaign went on for more than a year and gained the support of NABJ and many writers and writers’ organizations. In the course of the fight six writers were paid $6,700. We were ultimately successful in winning an agreement that will pay another 43 writers $78,520. In the first two quarterly payments, 14 writers received $30,340, paid-in-full. Based on the Ebony campaign we heard from unpaid writers at Nautilus, an award-winning science magazine based in NYC. What started with two or three interested writers grew into 23 writers owed about $75,000. In the course of the campaign six writers were paid about $7,000. We were able to achieve a payment agreement for the rest, without the use of the UAW legal department. So far, we have collected $42,000 for the remaining 18 writers. These are more than non-payment grievances; they are organizing campaigns, both in the sense that they help us win blocks of freelancers to the union and also in that it raises our visibility and draws more unpaid writers to the union, who have been screwed by other publications. Still another way these become organizing campaigns is that they allow us to work closely with other writers’ organizations. Take Ebony for example. In the course of that campaign we were able to establish close ties with NABJ, which is holding their 2018 convention in Detroit, Aug. 1-5. During the group grievance, NABJ very publicly gave Ebony the Thumbs Down Award for failing to pay their writers, and invited us to attend their convention in New Orleans to talk about the fight-back. We got a very warm reception and it started a discussion about NABJ establishing a freelance task force, which one of our new members is chairing. Also, when we reached a final agreement, NABJ wrote a great press release. At Nautilus, it turns out that most, if not all of the writers we represented were also members of the National Association of Science Writers (NASW). NASW was not in a position to represent them, but they were very impressed with NWU’s response which led to us discussing a pilot partnership program. The proposal would be a hybrid of two ideas, one in which NASW subsidizes their members’ paying a reduced rate to be full NWU members with full benefits, and the other in which NASW will subsidize a certain number of their members having access to contract advice and grievance handling from NWU. The NASW is proposing a level of payment for 25 of NASW members to access the contracts and grievance services and an unlimited number of members to join NWU at the $150/year rate. We would test this arrangement out for one year and revisit. It’s worth noting that NASW has two sister organizations, one of healthcare writers and the other environmental writers. They may both be interested. Also, NWU and NASW are members of the Authors Coalition and other groups expressed similar interest. This shows more potential and reflects the widespread nature of late payment and non-payment throughout the industry. It is also a sign that people may be more open to fighting back and seeing the union as a vehicle. Two relatively untapped resources are the new Freelance Isn’t Free law in NYC and our institutional membership in Volunteer Lawyers for the Arts. We potentially have two additional weapons in our arsenal in the broad fight against non-payment. Right after the DA, we will discuss with the Grievance Officers how we can make more use of both of these assets. For the individual writers, the big payoff is getting what’s rightfully owed to them. For all writers, the big payoff is building a bigger and stronger union that can defend freelancers and end non-payment. 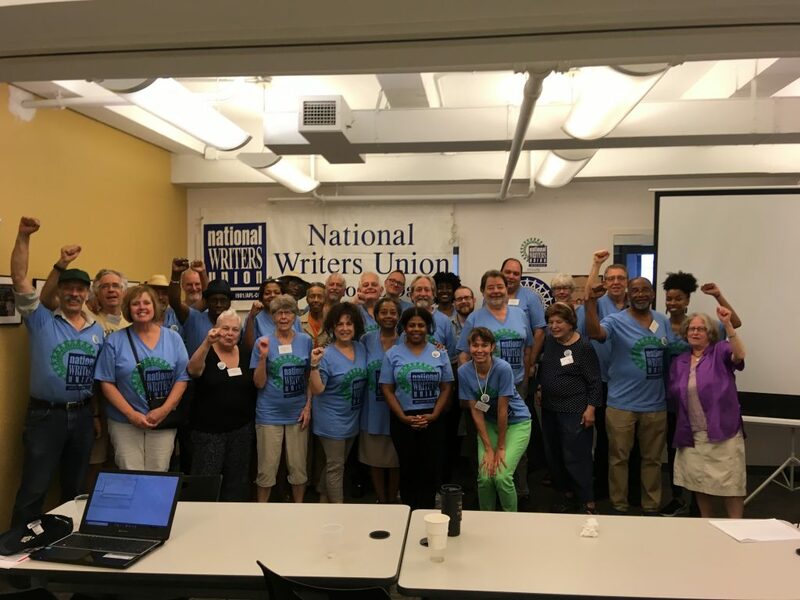 But for NWU, the big payoff is winning the working writers we represent in these grievances to contribute their experience, knowledge and leadership skills to the union. And this Delegate Assembly will give us a taste of that. Out of the Ebony group grievance, AJ Springer (Washington, DC) was elected to the NEC as Guide, Biba Adams in Detroit is the new Chair of the Southeast Michigan Chapter and Adeshina Emmanuel is the new Co-Chair of the Chicago Chapter with Jorge Mujica. Adrienne Gibbs (Chicago), a veteran international journalist recently represented NWU at the IFJ Gender Council meeting in Spain, and Demetria Irwin has been elected a Delegate from New York. They join VP Pamela K. Johnson (Heart & Soul) and former VP and current Sgt.at Arms Mauricio Niebla (Inkwell) who also met the union through group non-payment grievances, as did retiring Trustee Jan Kraus (Inkwell). As a result of fighting non-payment grievances, we are a stronger union. To be able to meet the growing demand, we are proposing to set up a group non-payment legal action fund in conjunction with the National Writers Union Service Organization (501c3) and raise money to help pay for legal costs associated with group grievances. We are proposing to initiate and maintain this fund with an annual fundraising dinner selling tables and ads to other writers’ organizations and unions, other UAW locals, and other progressive social justice organizations. We will also make direct appeals for individual donations from our members and others. At this dinner we will present the Ursula Le Guin award to an author or journalist that made a significant contribution to the social justice movement. This fund will be housed in NWUSO and all contributions will be tax deductible. The funds will only be used to cover the legal costs of group non-payment grievances that the National Executive Committee and the Grievance and Contract Committee agree should move forward. As other local unions must decide on which grievances go to arbitration, we will have to weigh which cases go forward here. And as with a strike fund, this gives us increased leverage and should be viewed as a serious threat to publications that don’t pay their writers. NWU’s international work has advanced and become a central pillar of the union. At its core is our affiliation with the IFJ. First off, by providing access to freelancers to the IFJ press card, we have attracted hundreds of two-year members with a very high renewal rate. We have also represented the IFJ at the UN in NYC in a number of ways; at the UN Commission on the Status of Women (UNCSW) for the past few years, and most recently, Adrienne Gibb (Chicago) represented NWU at the IFJ Gender Council meeting in Santander, Spain (more on both in the Women’s Committee Report). We have also represented IFJ at the UN’s World Press Freedom Day, and currently Alex Faiz is coordinating the NY end of two IFJ events to be held during the UN General Assembly in October, focusing on the fight against impunity against journalists world-wide. As a result of the IFJ having developed a certain confidence in our union, we were asked to provide a candidate to run for the Board of IFRRO, the international body of royalty distributors, publishers and authors. Book Division Chair Edward Hasbrouck (NoCal) is now in the second year of a three-year term that has greatly extended our voice and our reach both in Europe and in Washington, DC (more on this in the Book Division report). Another aspect of our international work has been our efforts to build the union among Spanish-language writers in the US, through Sindicato Nacional de Escritores. The work has been slow but steady with the union hosting numerous writing classes for Spanish-language writers and gaining some members. With our first non-payment grievance at a Spanish-language outlet, and more leadership to focus on this work, we could be on the verge of a small breakthrough here. We also provide peer review letters for authors and writers seeking O-1A and B visas, to work in the US for three years. In 2012 we did seven. The past two years we’ve done 70 each year, bringing in about $70,000 and a few new members. This year we have already done more than 60 letters and should surpass the past two years. This is a reflection of the increasing globalization of our industry and the fact that we have established ourselves as a reliable resource to many immigration law firms and the USCIS, who have posted us up on their website for individuals and law firms seeking O-1 visas. Still another important aspect of our international work is political action. Many of our members participated in marches and rallies opposing the US Government’s recent anti-immigrant actions, separating children from their families on the US southern border. We have also opposed the racist anti-Muslim travel ban, recently upheld by the Supreme Court, in word and deed. In NY, we have hosted forums and panels on the crackdown on journalists in Turkey, on the war in Yemen, spoke out against the massacre in Gaza, hosted union leaders from Pakistan and Somalia and a group of writers from Guangzhou, China. We also work closely with the FilAm (Filipino-American) press club of New York, where NWU member Marivir Montebon is the President. For many years, the ACA was a place where the 15 or so member organizations met to divide royalty money collected by RRO’s, primarily in Europe (See Edward’s report on IFRRO). The income from ACA cannot be used for salaries or rent, and can only be used for educational work or meetings and conferences that defend authors and copyright. Alex Faiz is on the Finance Committee and I am on the Distribution Committee. Because many of the member organizations are 501c3s, the ACA does not take positions or advocate for writers. But with the growing upheaval in the publishing industry, including copyright reform in the US and Europe, ACA member organizations have started holding monthly policy calls and taking more collective actions, like the recent visit to the US Copyright Office last May. Book Co-Chair Edward Hasbrouck and I represent the union on these policy calls. Between his expertise and work on copyright and our work on non-payment grievances, more ACA member organizations are looking to NWU on some level for leadership. It’s here that we have forged close ties with SFWA and ASJA and also where some member organizations are considering creating some kind of partnership with us to represent their members. We have even developed a better working relationship with the Authors Guild, although it’s still tenuous, since we were on opposite sides of the Google Book Settlement. While this is all complicated and uneven, it is a positive development with a lot of potential.